It’s called BikeLife Denver, and it promotes what the city is doing — and will do — to make Denver more bikeable. An article about redesigning the South Platte River Trail in the inaugural issue, for example, is a natural fit. The magazine also covers the basics for people who are curious about biking in the city but haven’t: how to trigger bike signals at intersections, how to get in the habit of biking to work, how to fix a flat. That sort of thing. The online and print publication came from DPW’s desire to reach people beyond the government’s typical constituency, said Rachael Bronson, a bike planner with Public Works. It’s a decidedly promotional tool, so don’t expect any critical analysis. But it’s not meant to flaunt achievements so much as to get more people on bikes. Nationally, 54 percent of people are “interested but concerned” about biking, according to People for Bikes, meaning they would bike more often if they felt safe and comfortable doing it. Denver hasn’t done a local survey, but DPW spokesperson Nancy Kuhn said the share of “interested but concerned” people is probably similar here. That is the intended audience for BikeLife Denver — the huge number of city residents who want to bike but aren’t yet. DPW’s distribution of BikeLife Denver targets people who may not know about what the city is doing to make biking safer. Yesterday, 8,000 copies of the magazine were sent to households — particularly households with children — within a mile radius of current or future bike projects, Bronson said, with 2,000 more distributed to local businesses. The distribution will likely change in the fall, when the second issue comes out, to reflect the projects going on at the time. 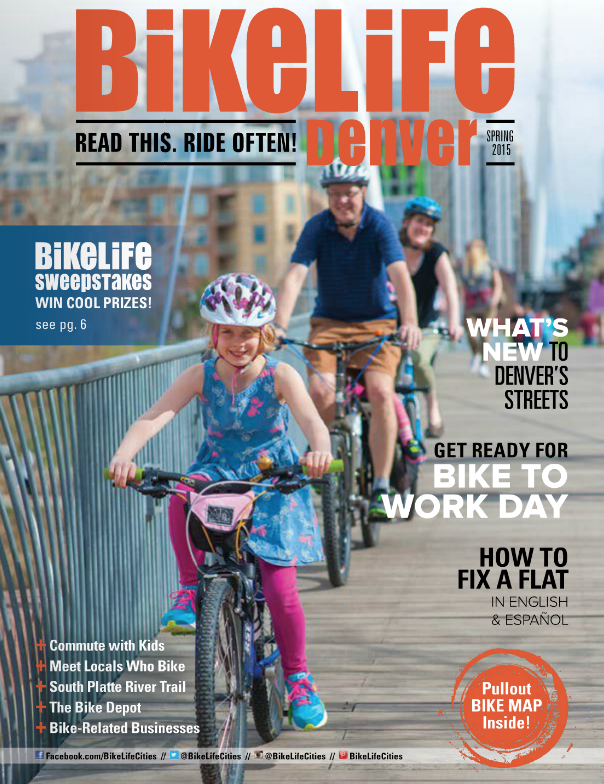 DPW works with the Boulder-based Colorado Catalyst Communications to publish BikeLife Denver. The company was founded by the late Leslie Bohm, who also co-founded Bikes Belong, which later became People for Bikes.